I only made half a pound of string beans, but definitely made all of the garlic butter because garlic. And butter. Yum! It made me think back to when I was a kid and we grew string beans in our backyard garden in Queens, way before urban gardening was a thing. There is nothing quite like fresh, sun-warmed veggies right out of the garden. I love the little squeeze of lemon at the end… it really brightens up all of the flavors. 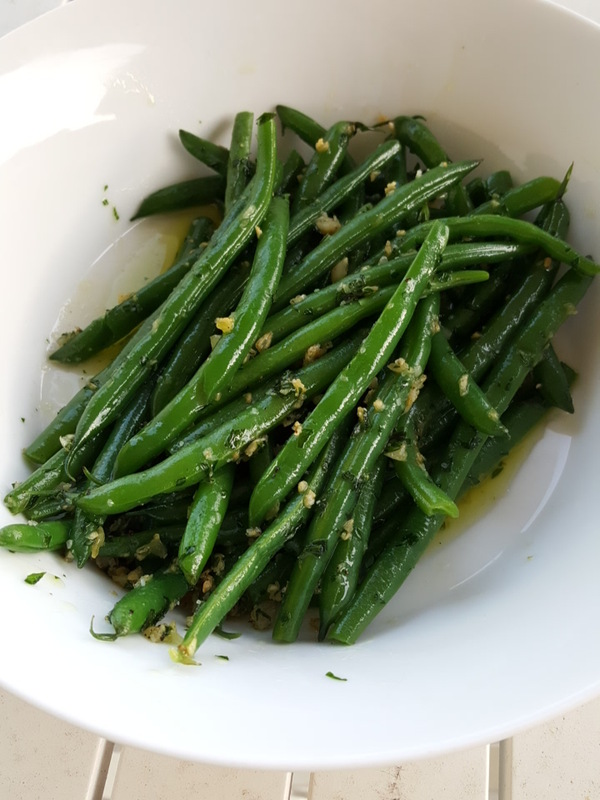 The only sad thing is that the green beans don’t hold the garlic and parsley too well, so tonight I made the garlic butter with broccoli, which holds all of the flavor bits in its florets. The even better part is how quick this is to make, which is perfect for a night where I have meetings running late. This entry was posted in My Paris Kitchen | David Lebovitz, Sides and tagged Cook the Book Fridays, David Lebovitz, Eat Your Veggies, My Paris Kitchen. Bookmark the permalink. This is delicious, even though I’ve forgotten to add the lemon juice! Love it, great as a side dish with any meal! Looking great! The snail butter is great with any vegetables, and especially broccoli! Oh I agree about the beans not holding the butter very well – and yes! Broccoli would be wonderful with this! Like the idea of a broccoli with snail butter. That’s another winner! These were yummy. I hope to try that butter/garlic sauce on broccoli soon, it was so good. I agree with you on a backyard garden, I grew up in Staten Island and my Mom grew so many things back then. So fresh and delicious. YES. broccoli with snail butter does sound fabulous and I totally agree about the green beans not holding the toppings! I didn’t mind that the beans didn’t hold the garlic and butter well – it meant I had lots leftover! These were so good and I think using the butter with broccoli sounds brilliant. I loved this butter. I served it on asparagus and now I can’t wait to try it on broccoli.